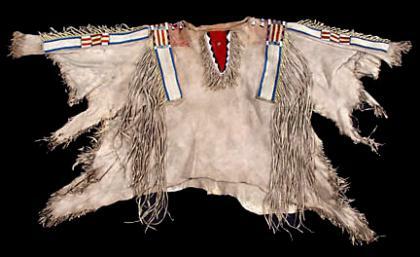 Shirts worn by Native American men of the Northern Plains were sometimes called "war shirts." They were elaborately decorated and the most splendid part of an outfit. The men wore these shirts during special occasions and when engaged in war parties because the shirts were ceremoniously adorned with powers of medicine to protect the wearer. However, these were rarely worn due to their weight and cumbersome flow. Simple hide shirts that weren't decorated at all were for everyday wear. Older style shirts were open on the sides, to improve movement while sitting and riding. Early shirt makers also left the legs and tail of the animal on their shirt skins, which added to the decorative and natural contours of the shirt. This Sioux shirt is decorated with a form of porcupine quillwork that was done in the mid - 1800s. Indian women used porcupine quills in several different ways, which include wrapping, braiding, sewing or weaving. Often the quills were dyed using brightly colored natural pigments. Several tribes of the Northern Plains and the Great Lakes regions practiced these methods, perfecting them in beautiful, elaborate pieces, such as this one. Wrapping was the simplest method of quilling and was used to cover long, slender areas or objects like pipe stems or shirt strips. Two techniques of wrapping were used; one with a filler of hair (horse, buffalo, or human) or leather, and the other without a filler. Moistened quills were bent around the object or filler that was to be decorated. When wrapping quills around a filler of horse hair, the ends of the hairs were left visible (as seen in the picture on the left), accentuating the artistic values of the quill worker. As new quills were added, the ends were twisted around the one before with a half-turn, which was then covered up by the next wrapping. This was continued with changes in color, adding to the design elements. Rows of quillwork, such as the red, yellow, and white ones on this shirt (seen below), were done separately and then anchored together with stitches to keep them in place. At first glance, this may appear to be beadwork; but upon closer examination one can see the exquisite beauty of a very old, very rare method of porcupine quillwork from the past. Contact with Europeans introduced brightly colored trade beads, which were easier to work with. Quillwork gradually gave way to beadwork, and eventually disappeared. Today, much of the knowledge of quill preparation and methods of quillwork has been lost.